When was the first time you visited a bowling alley? 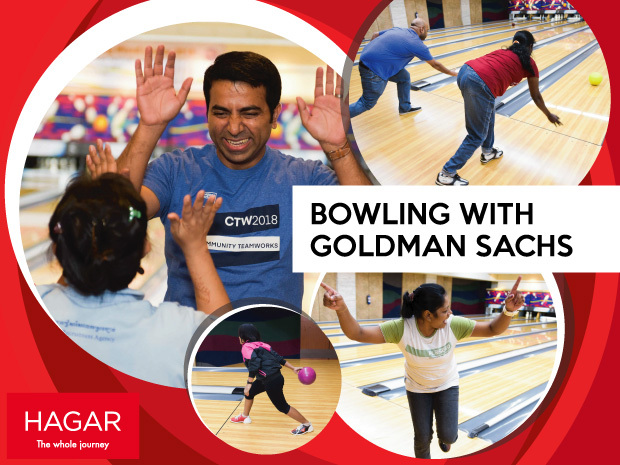 For some of our clients, it was just two weeks ago at our third annual bowling event with Goldman Sachs. On 28 June 2018, a group of girls in our care were treated to their maiden bowling experience thanks to the team from the Goldman Sachs Community Teamworks Programme. Apart from sponsoring and planning the entire afternoon of food and activities, representatives from Goldman Sachs added to the fun by participating in the games. Both the girls and Goldman Sachs’ representatives were split into ten teams and pitted against each other to see who would emerge as the overall champions. Anticipation and enthusiasm filled the air from the moment the girls entered the bowling centre. Bringing their best spirits, the girls cheered their hearts out, put in their utmost effort and were such a good sport throughout. The Goldman Sachs team was also extremely generous with their words of encouragement and advice, and soon enough, what initially began as two separate groups of people had now become one team that celebrated every possible moment. I was definitely thankful for my teammates who never stopped rooting for me despite my underwhelming performance. I wish you could have seen for yourself how the girls’ faces were literally shining with both hope and excitement during the prize presentation. Never would I have thought that there would be so much magic to a bowling ball. Despite being a team activity, each individual had an equal opportunity to score and with that, an equal stake in the team’s success. Having had the chance to interact with the girls myself, I was particularly delighted to see the girls shed their bashfulness and grow in confidence with each attempt. Indeed, just like how each team’s greatest hopes for a strike was pinned to each bowling ball released, so is our hope that each and every single girl will be empowered to have a fair shot at achieving their goals and dreams. As such, we are grateful for partners such as Goldman Sachs who have come alongside us in this journey to restoration and for helping to give the girls yet another memorable and refreshing experience. There is nothing more heartening than witnessing how a simple game can unite people of different cultures, languages, and histories. We look forward to more of such collaborations in the future. Written by Ms Esther Lee, currently an intern with Hagar Singapore. You too can help to free and heal communities from the trauma of human trafficking, slavery and abuse. If your company is looking for a meaningful community service project and you are interested to find out more about how you can assist survivors of modern slavery, please contact us.